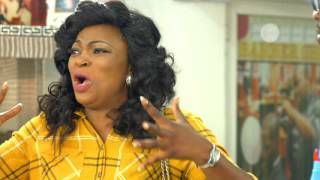 Goldmyne TV takes us behind the scenes of the Season 2 of Funke Akindele's star-studded TV series - Jenifa's Diary (Episode 2). The comic TV series is currently showing across many TV stations in Nigeria, including AIT; Nigeria Movie Network is broadcasting. Jenifa's Diary is a comedy television series that depicts the hilarious and amazing adventures of Suliat, a.k.a Jenifa. ; a secondary school dropout turned hairdresser who lives in a backwater town called Aiyetoro. 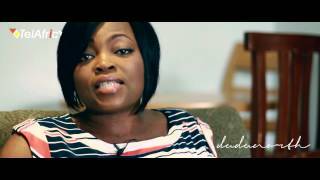 Jenifa is loud, over-bearing and very opinionated. She nurses the ambition of leaving her community and making something of herself. She is always trying to prove her worth and wants to be recognized and 'feel among'. Her competitive spirit with her peers comes to the forefront when she realizes many of her friends in Aiyetoro are in higher institutions. Jenifa is motivated to leave her community and pursue her dream of attending a higher institution and becoming a huge success and to enhance her status in Aiyetoro. With unexpected turn of events, Jenifa's adventures will take her from the streets of Lagos to high class shows to the corridors of universities which she does not attend, from crowded school hostels to Adult Education classes and back to the streets of Lagos, all in her quest to gain admission into a higher institution.